Altitude range: It grows at altitudes ranging from 1,400 to 1,600 metres above sea level. Habitat and Ecology: This cactus grows in typical Chihuahuan Desert vegetation among calcareous rocks. The major threats for this species are illegal collecting and human activities. The northernmost subpopulations near Saltillo are affected by the construction of an airport and the expanding chicken farms. Large numbers of plants have been and continue to be removed by collectors at known sites. 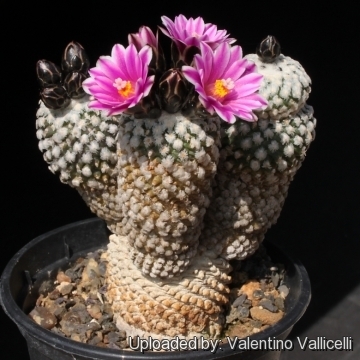 Gymnocactus valdezianus var. albiflorus (Pazout) Backeb. Normanbokea valdeziana (H.Moeller) Kladiwa & Buxb. Turbinicarpus valdezianus f. cristatus hort. 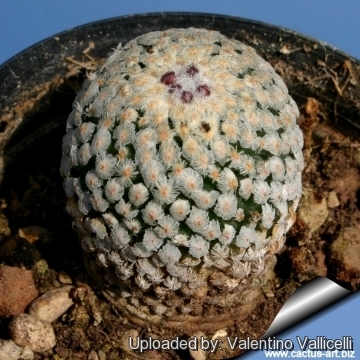 Pelecyphora valdeziana f. cristata hort. 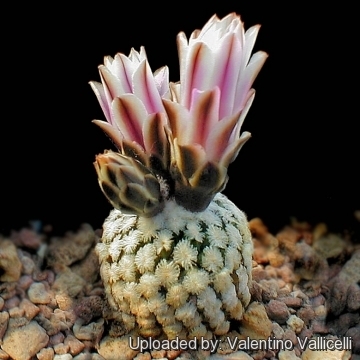 Description: Turbinicarpus valdezianus is one the smallest and slowest growing Turbinicarpus with tiny feathery spines that obscure the body of the plant, it is usually solitary but sometime form clusters of few branches. Stem: Young plants are spherical, then cylindrical with a narrower base and short spirally arranged tubercles, the apex is completely covered by the plumose spination. Typically half of it is underground with a big tap root. The plants are about 3-5 cm high and 1-2 cm in diameter. 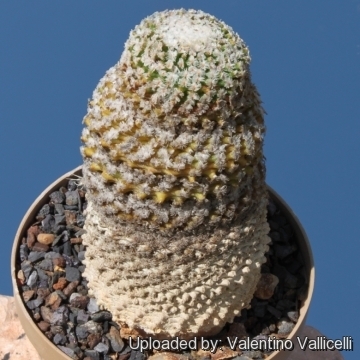 Spines: Turbinicarpus valdezianus is a pectinate-spines species, but the the pectinate spines are not in the two neat rows as in Turbinicarpus pseudopectinatus, the ca. 25-30 spines, are dense, feathery and white, about 0.5 mm long, spreading flat around the areoles. Flowers: One to 5 diurnal, at plant apex. 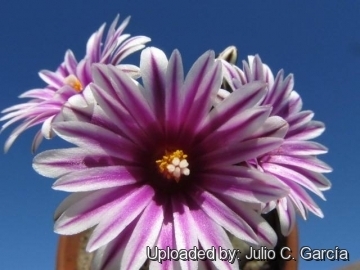 This species is found scattered in small populations in several locations and the colour of the flowers is variable ranging from pinkish-white to bright pink with darker magenta or reddish-brown midveins. Blooming season (in habitat): T. valdezianus is an early bloomer (February - March). 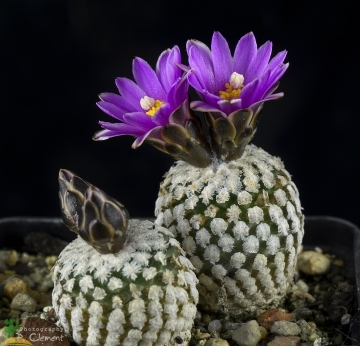 Turbinicarpus valdezianus (H.Moeller) Glass & R.A.Foster: This is one the smallest and slowest growing Turbinicarpus with tiny feathery spines that obscure the body of the plant, it is usually solitary but sometime form clusters of few branches. 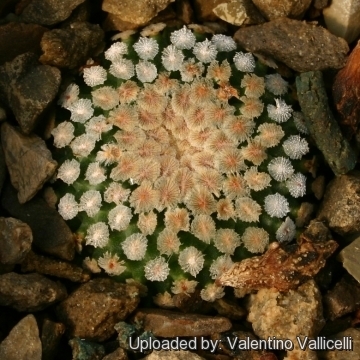 Turbinicarpus valdezianus var. albiflorus (Pazout) M.Zachar, Stanik, Lux & Dráb: This is the population from Matehuala characterized by pure white flowers, yellow stamen and white stigma. Turbinicarpus valdezianus f. cristatus hort. : Nice crested form with dense feathery white spines, spreading flat around the areoles. 4) Fitz Maurice, W.A. & Fitz Maurice, B 2013. 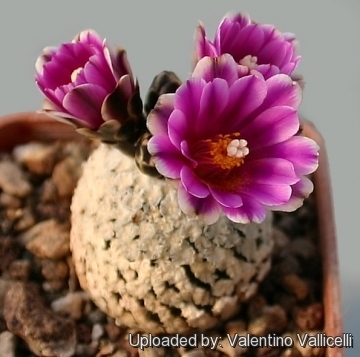 Turbinicarpus valdezianus. The IUCN Red List of Threatened Species. Version 2014.2. <www.iucnredlist.org>. Downloaded on 20 August 2014. Cultivation and Propagation: Turbinicarpus valdezianus is not particularly difficult on own roots, but very slow growing. 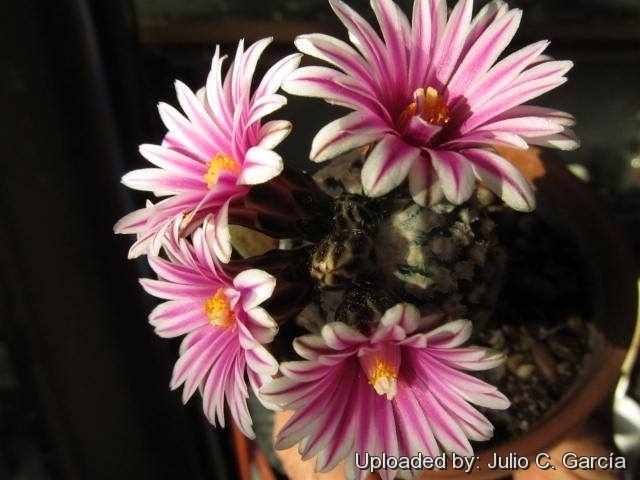 Soils: It likes very porous standard neutral or slightly alkaline cactus mix soil. Watering: It should be watered during the growing season, but waterings should be rather infrequent to keep the plant compact, and avoid it will become excessively elongated and unnatural in appearance. Keep dry in winter or when night temperatures remain below 10° C. Water it less than average if in bigger pots, small pots preferred. Furthermore it has a tap root, and watering it properly is often difficult, because it tends to crack open or rot if over-watered. Careful watering away from the body of the plant will allow the areoles to keep their wool. Hardiness: It is hardy to -4°C for a short period if kept on the dry side prior to, and during, cold weather. However warmth throughout the year will increase the grower's success (8-12°C during rest season). Assure a good ventilation. Exposition: Outside bright, hot conditions or afternoon shade, inside it needs bright light, and some direct sun. Strong light keep the plant compact and low and encourages flowering and heavy wool and spine production. Propagation: From seed, since the plant rarely produces plantlets, or grafted. Seeds germinate in 7-14 days at 21-27° C in spring, remove the glass cover gradually as the plants develops and keep ventilated, no full sun for young plants!